I am growing pickling cucumbers in my garden this year for the first time with the sole purpose of turning them into homemade dill pickles! But, I came across locally grown small cucumbers at our small grocery store in town, and figured that since I’m on such a canning kick…I’d give it a whirl to see if it was worth it! I couldn’t find fresh dill for the life of me around town and I really don’t want to start it in my garden, because it’s called dill weed for a reason — it can get out of control very fast! So, in the canning section of my grocery store I found a dill pickle mix by Bernardin and thought that seemed like a reason easy alternative. 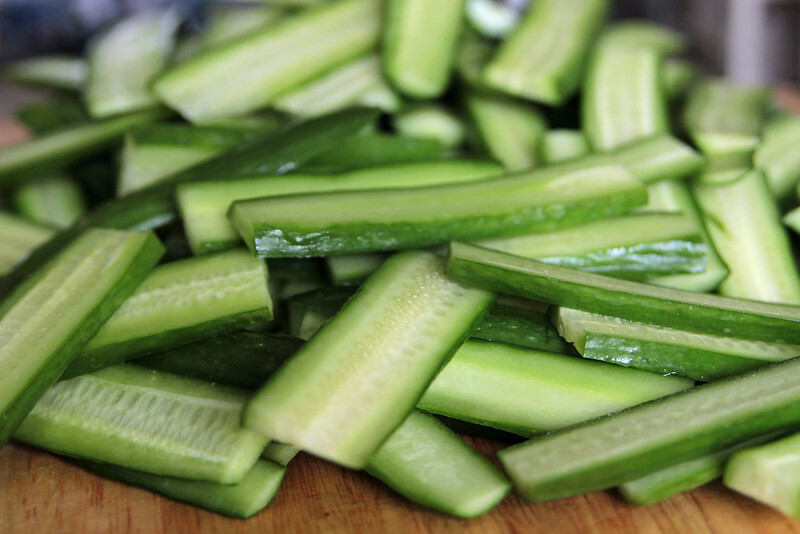 Prepare your pickles by cutting the ends off of cucumbers and slicing them or cutting them into quarters for 4 “spears” and place into large bowl. I preferred to slice them so I can put them on burgers and sandwiches easier. Combine water, vinegar and dill pickle mix in a medium saucepan and heat to a boil and pour over cucumbers in the bowl. Cool to room temperature, about 30 minutes. Pack cucumbers into clean jars — since I sliced them and could fit more in a jar, I used 2 tightly packed or 3 more loosely packed 16 oz jars. The directions say to use 2 – 1 litre jars if you are cutting into spears; if you are slicing I imagine 1 – 1 litre jar would suffice. 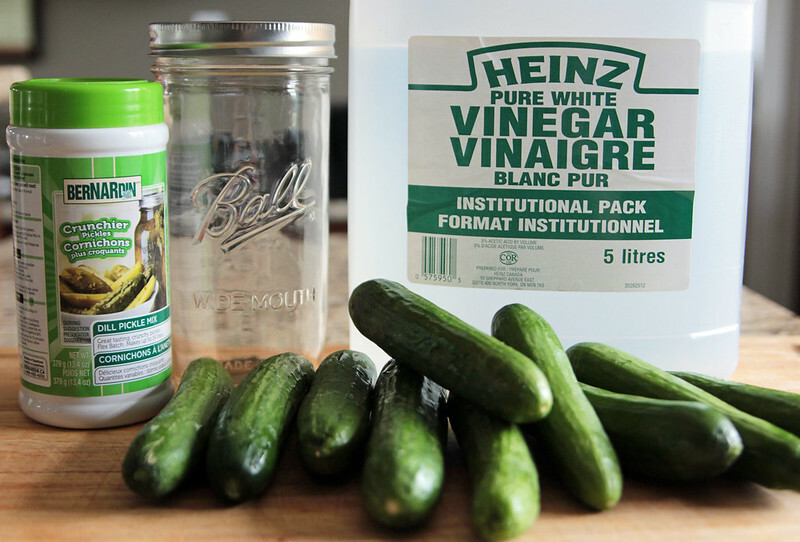 Ladle the pickling liquid over cucumbers into jar, place lids and bands on jars and refrigerator for 3 weeks. Will last in refrigerator up to 3 months. Super easy, super crunchy homemade dill pickles with only 3 ingredients! Prepare your pickles by cutting the ends off of cucumbers and slicing them or cutting them into quarters for 4 "spears" and place into large bowl. Combine water, vinegar and dill pickle mix in a medium saucepan and heat to a boil and pour over cucumbers in the bowl. Cool to room temperature, about 30 minutes. *Pack cucumbers into clean jars. 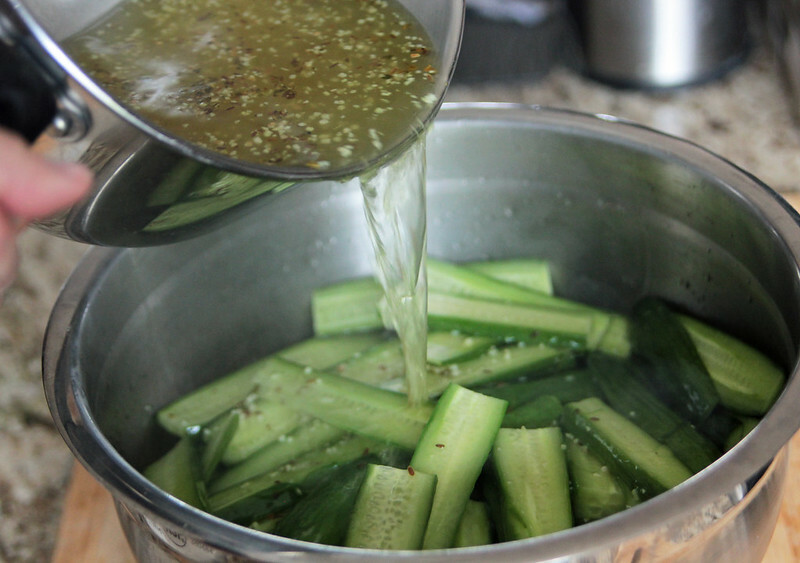 Ladle the pickling liquid over cucumbers into jar, place lids and bands on jars and refrigerator for 3 weeks. Will last in refrigerator up to 3 months. 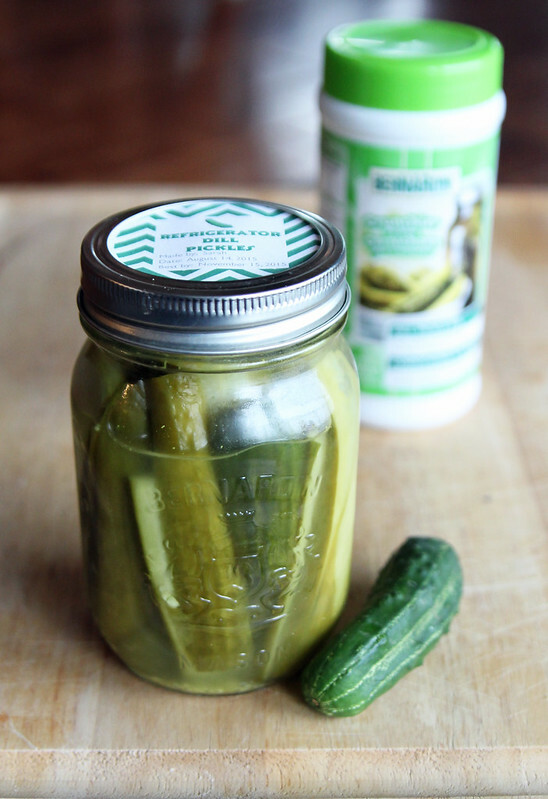 *Since I sliced my cucumbers and could fit more in a jar, I used 2 tightly packed 16 oz jars. The directions say to use 2 - 1 litre jars if you are cutting into spears; if you are slicing I imagine 1 - 1 litre jar would suffice. My review was that these are amazing. So simple, and surprisingly crunchy. I was really worried these wouldn’t be crunchy, but they were and the family loved them so much we ate almost an entire jar with sloppy joes the other night! I have never made refrigerator pickles before and I see no need to try any other recipe. The Bernardin mix did not disappoint and it was so handy to have it all premixed. By the way, this is not a sponsored post or even an official review. I bought all this stuff at the store and I was drawn to the Bernardin mix because my grocery store didn’t have fresh dill, like every other recipe called for. It’s also nice that you can use household white vinegar and not have to buy 7% pickling vinegar, if you don’t plan on pickling anything else. These would make a great gift too! Definitely going to try this. Thank you! Thank you so much for this, Sarah! 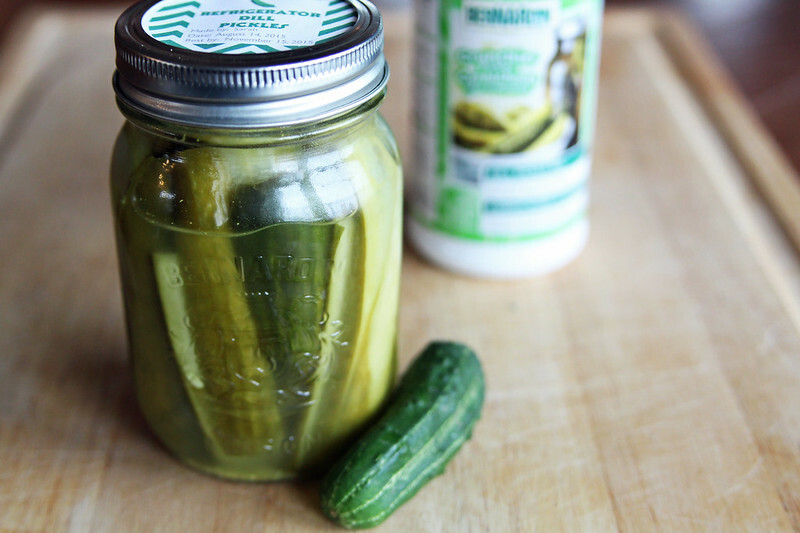 I have been wanting to make my own dill pickles, and this seems so much easier!